By Carol Schaal ’91M.A., managing editor of Notre Dame Magazine. Reprinted with permission. As the NCAA commercials make clear, most college athletes don’t make the pros. This can be a tough reality to face. Unless, that is, you come up with a Plan B — a plan which both keeps you in the game and celebrates the game itself. And, as a nice side bonus, let’s you travel the world with your future spouse. That’s precisely what Luke Boughen (ND class of 2005), who played soccer for Notre Dame, and Gwendolyn Oxenham, who played soccer at Duke University, did. The duo met during a pick-up game on the Notre Dame soccer fields after Oxenham enrolled in ND’s creative writing program (she graduated in 2006). The end result of their Plan B is the documentary Pelada, co-directed by Boughen and three former Duke students, Oxenham, Rebekah Fergusson and Ryan White. A grant from Duke helped get the film started. “It was great to be quitting the job and getting out there,” says Boughen, who was selling billboard advertising when the film grant came through. Oxenham, who was the recipient of a writing grant as Notre Dame’s 2006 Nicholas Sparks Prize winner, went on hiatus from working on a book to join the documentary crew. “We truly believe in the message that we pitched: ‘Soccer creates intimacy between strangers,’” Oxenham says of Pelada, which can be purchased at pelada-movie.com. 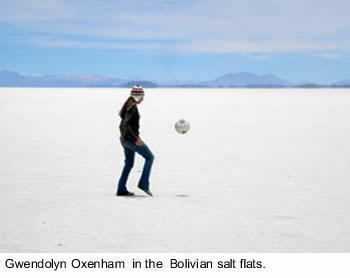 The message was about three years in the making, as Oxenham and Boughen, with Fergusson and White behind hand-held cameras, played pick-up games in 25 countries, from China to Brazil to Kenya to Iran. “Everywhere” included a prison in La Paz, Bolivia, where the crew bribed their way to play with inmates inside the walls; a game between Jews and Arabs in Jerusalem, that, says Oxenham, “most tested the idea that soccer unites”; and a game in Tehran, where Oxenham broke the law by managing, headscarf in place, to join an all-male game. Pelada, the doc’s name, is Portuguese for “naked” or “bare-bones,” the Brazilian term for street games. For the film crew, it also applied to their planning, at times almost grab-and-go, as they’d show up at slums and construction sites and dirt fields and parks and, in Tokyo, rooftops, to seek entry into a game and conversations with the players. Once invited, however, the hospitality often didn’t stop. “It was better than we imagined,” says Oxenham, with invitations to meals and even lodging often following a pick-up game. The reviews are nice. So is the continuing connection with some of the filmmakers’ former soccer teammates. “Facebook is an incredible thing,” says Oxenham, noting that the film crew keeps in touch with several of the players who appear in the movie. Beyond “madly trying to raise money through donations,” Oxenham and Boughen are focusing on their post-Plan B lives. Oxenham is teaching at Orange Coast College in Costa Mesa, California, and wants to complete her unfinished book project, while Boughen just completed his first year at the University of California, Irvine, School of Law. And then there’s that wedding, “If we can get it worked out,” says Boughen with a laugh. Scheduled for early June, the wedding should pose no problem for a couple who survived being detained in Israel, arrested in Germany and attacked by a baboon in Nairobi, all for the love of a game.